Here is some info on the guy the Bolts will probably take in the draft. Victor Hedman is a 6'5" D Man who has been compared to the likes of Chris Pronger. He is from Ornskoldsvik in Sweden, the same hometown as Niklas Sundstrom, Peter Forsberg, Markus Naslund, Daniel Sedin and Henrik Sedin. Must be something in the water! “He has a lot of energy on the ice, he is a big strong guy. He has offensive skills, he is a good skater with long strides, he has a good sense of play, he can do everything,” said the coach of the Swedish Junior Team Par Marts. He's going to need to be able to do a bit of everything if he does indeed come to the Lightning. Check back here often since I'm sure that RJ will be coming up with great people and great things. Thanks again, and I hope you enjoy playoffs. I'll see you guys around. 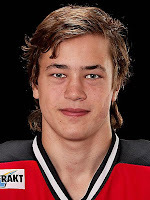 Assuming they don't trade that pick away - because it could happen - the Lightning will likely take Victor Hedman of Sweden as the second pick overall in June. Let's be honest, through serious mismanagement, the <?xml:namespace prefix = st1 />Tampa Bay Lightning simply cannot afford him - despite having been the ones who negotiated that 11-year, $85 million contract extension with Lecavalier in the first place. They just laid off 20 people from the front office just yesterday. If you can't see the writing on the wall just with that, then I don't think I can penetrate the level of denial that you're living in. If Lecavalier's lucky, they'll trade him before his contract extension kicks in July 1st. If he's really unlucky, he could be sitting out or playing hockey in Europe next season because they didn’t trade him before July 1st but instead tried to trade him afterwards. To current team ownership, no-trade clauses mean absolutely nothing. They happily signed Dan Boyle to a contract with a no-trade clause last February, and still managed to move him by July. So even if they can't find a deal they like before that contract extension kicks in, they might try to force Vinny into allowing them to move him to another team, anyways - like they did with Boyle. And if Lecavalier gets stubborn about it and says no, then that could mean him sitting out or playing in another league. Or more. The initial former head coach, John Tortorella, was furious with how he was fired. Boyle complained of being treated very badly when he was forced to waive his no-trade clause. Former GM Jay Feaster was ignored by ownership and management alike until he got the hint and quietly went away on his own. The former head coach after Tortorella, Barry Melrose, was unceremoniously canned after 16 games. Mark Recchi wasn't impressed with how he was treated when he was dealt to Boston. And I suspect that Gary Roberts was conveniently forced to retire in an equally unpleasant fashion, but is so far keeping quiet. Obviously, this ownership/management group already has something of an unsavory track record in how they deal with people they find to be expendable. So if Lecavalier genuinely believes that they'll follow through with their promise to contact him, and/or his agent, before they start talking with other teams, then he's a wide-eyed optimist. They certainly didn't do that before they almost traded him to Montréal in January. And I seriously doubt that they'll do it before they actually do ship him off sometime this summer. It could get really ugly, and really complicated, really fast. And it could end up involving a lot more than just a single player, his agent, and the GM. The worst case scenario could involve the players union, the league, the owners, and litigation. It just depends on how both sides deal with any of a number of scenarios. So what are the facts that lead to the conclusion that Lecavalier is likely gone? Dan Boyle signed a 6-year, $40 million contract with a no-trade clause 25 February 2008. Steven Stamkos is drafted first overall by the Tampa Bay Lightning in the 2008 NHL Entry Draft in Ottawa 20 June 2008. Boyle is traded to San Jose with Brad Lukowich for Matt Carle, Ty Wishart, and two draft picks 04 July 2008. Vincent Lecavalier signed an 11-year, $85 million contract 13 July 2008. Melrose is fired 16 games into the season 15 November 2008. Rumors went around that Lecavalier was a reason why he was fired. By 14 January 2009, while the team was in California, rumors are flying that there's a deal in the works between Tampa Bay and Montréal. Lightning GM Brian Lawton flatly denies the rumors that he has been shopping Lecavalier to Montréal. Lecavalier goes to the All-Star Game in Montréal 25 January 2009 and holds court with all of the NHL's Canadian hockey media stating over and over again that he has no control over the situation. 18 February 2009, Montréal Canadiens' GM Bob Gainey reveals that negotiations with Tampa Bay for a Lecavalier trade were, in fact, going on in January. Lecavalier's season ends early by having wrist surgery 03 April 2009. Stamkos ends rookie season with 23 goals and an invite to Team Canada at the World Championships. 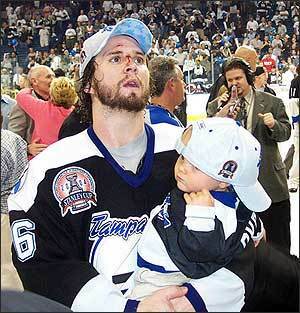 The Tampa Bay Lightning ends the 2008-2009 29th overall in the NHL, and is awarded the second overall pick in the 2009 NHL Entry Draft in Montréal. The fundamental problem with Lecavalier's contract situation is one simple fact - under the current Collective Bargaining Agreement (CBA), players are not allowed to renegotiate standing contracts. Article 11, Section 11.10 of the NHL-NHLPA 2005 CBA states that "No Renegotiation. In no event shall a Club or a Player negotiate a change any terms of a Player SPC [Standard Player's Contract] for the then-current season or for any remaining season of an SPC." I can understand why the NHLPA would want that little blurb in there, but it's a little shortsighted if you ask me. There should've been some amendment to that allowing renegotiation under certain extenuating circumstances. The economy notwithstanding. It helps the players in the short run, but not in the long run. In Lecavalier's situation, if allowed to renegotiate in the case where the contract is detrimental to the team due to economics (yes, I know - really poor management), and if the player is above a certain age and wants to stay since he has a vested interest in the community and has been with the same team for a certain length of time, then they should be able to do that. I realize the NHLPA’s argument against that is that the team should never have signed a player to a contract that they ultimately couldn't afford and the team ought to pay the penalty - even if it's at the detriment of the individual player. And it sets a bad precedent to allow a player to downgrade his contract in the overall scheme of the union. It's for the greater good of the union and the players overall and blah, blah, blah. But ultimately, shouldn't it be the other way around? Isn't the union supposed to represent the players and not the players represent the union? I can't help but wonder if Lecavalier realizes just how much power he has in this situation. It'd be easy for a person in his position to feel powerless, but he's probably got the most power of anyone in this situation. For instance, he can beat the team to the punch and ask for a trade before the draft. Or, in the event that they try to force him to waive his no-trade clause after July 1st, he can refuse and cause all kinds of problems. Not just for the team, but for the NHL and/or the NHLPA. He could force a revamp the CBA all on his own, for good or ill. He doesn't strike me as the kind of guy who would do that, but there are all kinds of options there for him to do, or not do, as the case may be. No one wants to see Lecavalier go - his coaches don't, his teammates don't, the fans don't, and Vinny himself doesn't, either. Whether the owners and management do or not is up for debate. But the fact is that he was as good as gone when they drafted Stamkos, traded Boyle, and signed Melrose last July - even before he signed that contract. It was just a matter of time is all. That was obvious to me at the time, although most people didn't seem to understand that. Now it's a matter of where he'll end up. The most obvious choice is Montréal, but I don't know if that's likely. They definitely want him, but does he want them? And if it is open season on Lecavalier, and the entire league gets a shot at him, will the Canadiens be able to offer the best deal? Who needs a world-class center in his prime, who has the depth to get him, and who can afford his contract under the salary cap? I'm guessing that there are only a handful of teams that would be able to meet all of those criteria. I haven't touched on whether or not Tampa Bay will get what they should for Lecavalier in a trade. The reason for that is what most people would agree would be a good deal is probably not what the Lightning will want. In January, the asking price seemed to be pretty high - or so the rumors went. However, I think that the asking price is going to drop significantly this summer for payroll reasons and due to time constraints. There's no way that the Lightning are going to be able to get what he's worth out of another team - even the generally agreed value and not the pie in the sky value they'd placed on him midway through the season. Other teams know that they have to get him off their payroll before July 1st, so other teams will work that to their advantage. I expect they'll end up trading him for almost nothing because of it. Relatively speaking, I mean. Will Lecavalier stay? Will he go? And if he goes, where will he end up? Your guess is as good as mine. Right now, though, it looks as if he'll probably end up going. We'll see how it ends up. Eventually. The Tampa Bay Lightning lost their last game of the 2008-2009 season to the Atlanta Thrashers 6-2. Wow. That was a miserable little season, wasn't it? Thank god that's finally over. So the Lightning end the season how they started it - on a losing streak. The started the season with a five-game losing streak (0-2-3; all one-goal losses), and ended it with a nine-game losing streak (0-5-2; losing by an average of two goals every game). Sadly, with trades, injuries, and all of the other nonsense that went on this season, only five guys that were in the lineup for the season opener in Prague were in the lineup tonight: Artyukhin, Mihalik, Prospal, St. Louis, and Stamkos. And of those players, only Prospal and St. Louis played every game this season in between. The game started out well enough for the Lightning. They out shot the Thrashers in the first period 13-7, had a power play goal, and had some good energy. Of course, there were three fights, they gave up a shorthanded goal, and also a power play goal. But they were still accomplishing things. Then they gave up three goals in the second and pulled their goalie McKenna. And it just went downhill from there. They weren't great on faceoffs, and took too many penalties, but they did outshoot Atlanta 35-26 on the game. Strangely, they seem to get more goals when they shoot less. I don't know why that is, unless it takes the opposing goalie out of the game. There will be a season recap forthcoming in the next few days. Not so much to revel in the agony and horror, or even to point out what went wrong. It's to document the series of events that led the team to this place and to perhaps give us all hints as to which direction it may be going. Past actions typically indicate future ones, after all. It ought to be interesting to see who's been hiding minor injuries - and who else will be going in for surgery - this coming week. As well as who will be invited to join national teams. Other than the draft lottery on Tuesday, it should be relatively quiet and uneventful in Tampa for the next couple of months. At least until right around the draft in June. So sit back, relax, and figure out which team you want to follow during playoffs. And there's always World Championships in Switzerland towards the end of the month. If you have the energy or interest for either of those, at this point. I'm hoping that San Jose (with Dan Boyle & Brad Lukowich) wins the Stanley Cup myself. Thanks for reading and keep checking back for more posts this offseason. The Tampa Bay Lightning lost to the Washington Capitals 4-2. I actually got to watch this game on tv instead of on my computer because I live in Virginia. The Caps announcers are alright, I suppose. Sort of middling since I've heard better and I've heard worse. Although, they were a pretty happy couple of guys. But it's easy to be happy in sports when your team is winning, right? The first period was pretty good. Stamkos's goal in the first was beautiful. It was one of those plays that just magically came together. Konopka had a stumbling poke check that ended up on Stamkos's stick and he one-timed it and it went in. The second period wasn't so nice. The Lightning looked tired to me. But then, they've collectively been looking tired to me for the last few games. Both mentally and physically. Penalties ended up being even, strangely. I say "strangely" since there seemed to have been a lot of penalties against Tampa Bay. But maybe that's just because they were one after another in the first. After all of those penalties in the first and second, the refs just let the players play in the third. Again, being down by a couple of goals going into the third, the Lightning stepped it up and played a pretty good period. Pettinger got a goal to get the team within one of Washington, but that's essentially how it ended. Empty net goals don't really count when it comes to overall team effort. They just count where it matters most - on the scoreboard. Considering that the Lightning played with only one full-time NHL defenseman against the fourth best team in the NHL, they really did pretty well. I never got the sense that the Capitals were playing down, so it was a genuine effort on their part. Seriously, that's pretty respectable. And maybe they did so well because the defensemen that were playing for Tampa Bay already knew and played together in the AHL. It's hard to say, really. On a completely different, but still hockey related, note.... Women's Ice Hockey World Championships have been going on in Finland. Tomorrow, the United States plays Canada for the gold, while Sweden plays Russia for the bronze. Women's ice hockey is an Olympic event, with the first medals awarded in 1998. The United States won the first ever Olympic gold medal for women's ice hockey in Nagano, Japan. The Tampa Bay Lightning lost to the Pittsburgh Penguins 6-4. This game started out slow for both teams. You almost had to wonder if anyone cared enough to do anything. Other than St. Louis, of course. Things sort of drifted along until the second period when Pittsburgh started scoring. And then, true to season form, the Lightning attempted a comeback from a 4-0 deficit in the third period. If they could start a game being down by three or four goals, I think they'd do so much better. It seems to be the way they prefer to play. Or something. It doesn't make a lot of sense to me, but that's the way it's been all season. Ramo had a pretty good game, but I've seen him do better. Halpern had a great second half of the game. St. Louis finally got his 30th goal of the season. Unfortunately, Malone broke his right hand while blocking a shot - or so I'd heard was the case. Hopefully, that's just a simple fracture and not something more complicated. Special teams were awful. They couldn't convert on the seven power plays they were given. And they allowed two goals during the five penalty kills they had. But they did out-shoot the Penguins 37-31, so that was something. Now here's something a lot of hockey fans don't think about: who's playing the music. We notice when the songs are good, and when they're not, but that' usually about as far as it goes. At least, that's the case for me. Here's an inside look on what's going on behind the scenes. By my friend Su. The Tampa Bay Lightning lost to the New York Islanders 3-1. Is it just me, or does it seem like the worse the officiating gets, the longer the games end up being? This was the Lightning sixth loss in a row, and their ninth loss in their last ten games. The worst part isn't all of the losses or all of the injuries. It's the fact that they've actually played good games but have not been able to win them. Four of those losses were in overtime, after all. This game against the Islanders is a good example of that. They actually out shot the Islanders 30-21, and put up a good sustained effort most of the game. But they weren't able to score more than one. Special teams were about average. They converted one of their three power plays, but allowed two goals on five penalty kills. Along with that, they also took those penalties which gave the Islanders those power plays. And faceoffs, while better than the previous game, weren't that great overall. Karsums had a good game. He seemed really into things. Of course, his six penalty minutes weren't exactly great, but you take the good with the bad, I guess. Pettinger had a good game as well. Stamkos started and ended strong, but then sort of disappeared for the middle part of the game. So it wasn't the usual characters that really ran the game on the Lightning side. The Tampa Bay Lightning lost in overtime to the New Jersey Devils 5-4. It's always interesting to see how a team does after they lose a key player. Sometimes they're broken, sometimes they're improved, and sometimes it has no discernible affect - or various stages in between. The Lightning, it seems, were all three. What was broken were the faceoffs. They were awful. They only won a third of the total faceoffs. It's clear that Lecavalier was the guy propping up those stats. Maybe not all of the time - maybe - but often enough. What was improved were their special teams. Sure, they only scored on one power play, but they only had two. That's 50% efficiency right there. And their penalty kills weren't bad, either. What was unaffected were the shots. They started off strong in the first, and then they turned into a trickle in the second and third. They also gave up just almost 40 shots again this game, too. Ramo was again brilliant. It may not seem so with him letting in five goals, but he was. The score could've been a lot higher. Artyukhin also had a very good effort on the night. He stepped his game, which is a good thing. And I noticed that the defense featured in three of the four Tampa Bay goals with assists. So good for them. By the way, congratulations to Stamkos for tying the team rookie goal scoring record.